Most viewers of the TV drama The West Wing can recall feeling almost out of breath following the cast as they hurtled down hallways, rounded corners, ranged around the enormous set. All thanks to the Steadicam camera operator. 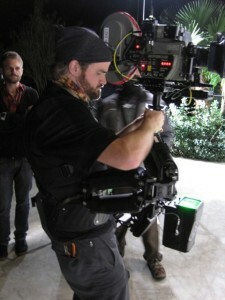 Today we have Steadicam operator Will Demeritt talking to us about Steadicam applications. 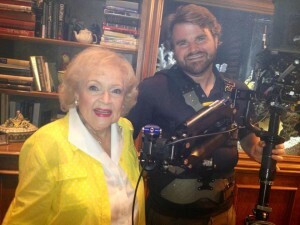 Why does a director choose a camera stabilizing mount rather than a tripod or dolly for the shot? “The first application, a specialty master, is the sort of iconic shot that filmmakers generally talk about for years and years, affectionately referring to it by the name of the film: the Atonement shot or the Goodfellas shot. For the unaware, the Atonement shot refers to the five-minute long shot at Dunkirk. The Goodfellas shot refers to Ray Liotta and Lorraine Bracco arriving at the Copacabana. “In this application, a single shot can tell a compelling piece of the story through uninterrupted involvement with the characters. The Atonement shot, for example, keeps us with James McAvoy through his arrival at Dunkirk, and over the five-minute shot we see the disarray, confusion and anxiety of all the soldiers mustering at the beach. If the shot were edited, we might get some ‘relief’ from the tension, distracting us from the stress of the scene and the weight on the main character. “You may not get Larry McConkey or Scott Sakamoto, but you’ll never know unless you ask. Steadicam operators value the opportunity to bring a practical education to film students whose practical experience is just taking root. We always make sure to remind the students what a good Steadicam operator costs, but we frequently throw numerous discounts to students looking to learn. I find it amazing that so many filmmakers, directors, producers and DPs get so far along in their career without ever having worked with or hiring a Steadicam operator. Demeritt’s recommendation: “Just call up the Steadicam operator and talk to them. If you identify yourself as a film student, they will very likely treat the call as a teaching opportunity rather than a business opportunity. Education and experience still costs something: the student gains experience which makes them more valuable, and the Steadicam operator gives up time and gives access to equipment, so compensation is most likely going to happen in some way. “I believe that technically, the first film a Steadicam was used on was (the Woody Guthrie biopic) Bound for Glory in 1976. Though that was filmed first, Rocky was filmed after but released to theaters first, making it the first theatrical film to use Steadicam. See Will Demeritt’s demo reel and his filmography.